Before this journey I had never ventured into Africa, let alone to be there completely alone without my parents. Throughout my Conservation Project, I found that Kenya is a beautiful country, especially the huge vast plains where the animals could roam freely. Everyone was so friendly and I did not have to worry about too much especially since the Projects Abroad coordinators were always there for me. My placement was an approximately three hour journey from Nairobi. We stopped at an overlook to see a part of the Rift Valley, there I was greeted by many people who came and shook my hand and made me feel welcome in Kenya. When we arrived at my accommodation, it was in the middle of a tranquil African field, where impala and Zebra could be seen meandering about their daily business. On meeting the Projects Abroad coordinators, I found they were friendly as they quickly shook my hand, showed me around the house and I quickly acquainted myself with the other volunteers. Later that day we were taken to the closest town of Gilgil. This showed me the hustle and bustle of a rural Kenyan town. We found the supermarket and bought what we thought we needed to help us on our placement. The two weeks in my placement were spent surveying giraffes, lions, birds and building work to help with the conservancy. The number of picture opportunities was stunning! We even visited schools and orphanages; this was a highlight on the trip as the children loved to wave and say hello. We even played a game of football against a local school! This all helped to make my placement special and worthwhile. The other volunteers were welcoming and friendly; it was hard not to make friends while being in Kenya. Many nights we would sit and talk while playing card games, many that I’ve learnt and now play with other friends. Or we would use a projector to watch a film. The guesthouse also had a table-tennis table and volleyball net; we would spend many of our afternoons or lunch breaks having great six versus six games. The food was superb and it was cooked by the staff. They made us food from back home, but my personal favourite was the chapatti that was handmade. We could choose to eat inside or out depending on if weather allowed. It was always a relief to come back to the guesthouse after a hard day’s work from digging or surveying. During my two weeks there, I spent one weekend travelling around Kenya. 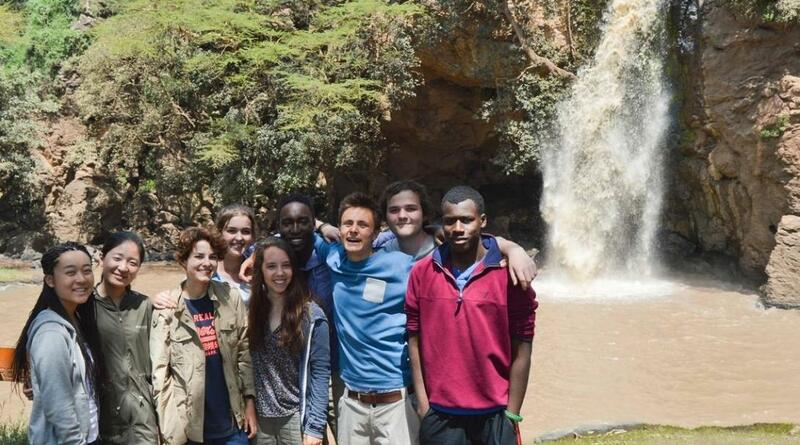 The coordinators had planned for us to take a trip to two national parks – the famous Hell’s Gate National Park and Nakuru National Park. Hell’s Gate was my favourite during the journey as it went through rough mountainous terrain. The other volunteers and I were constantly brushed by twigs and encroaching trees which made the experience even more exciting! Upon arriving at Hell’s Gate, I found out why it’s famous – the name came from its hot springs and it was used as a design for the Lion King movie. We cycled through the park, coming across the "Devil’s Bedroom" where we saw warthogs, zebras and baboons. In Nakuru National Park we were not allowed to cycle through, however at certain spots we were allowed out, one such spot was at a waterfall! After my two weeks were up, I was sad to be leaving. Originally I thought I would be glad to come home, I was tired after all the work that I had done, but I still wanted more. Driving back to the airport in Nairobi we stopped at the overlook one last time. After buying a souvenir we carried onto the airport from which I took my flight home. Upon arriving home at London Gatwick Airport, when I greeted my mother she said I had grown up and I looked two years older! The first night back home was the hardest since I was already missing Kenya and its beautiful people and scenery. However, it has left me hungering for more adventure. It is now a goal of mine to go back to Africa and volunteer again, but next time for a longer period of time.